What is Youth Capture the Colorful Cosmos? Student astrophotographer at Carolinas Aviation Museum (Charlotte, NC). Photo credit: Carolinas Aviation Museum. 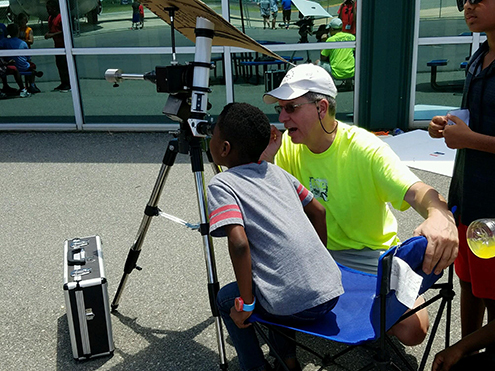 This program engages youth audiences in accessing SAO’s MicroObservatory robotic telescopes, to take and colorize their own images of stars and galaxies the same way that professional astronomers do. Participating Affiliate organizations learn how to run public workshops that result in digital or physical exhibitions of original youth-created astrophotography displays. These images and displays can be featured not only at the participating organizations, but also on Smithsonian websites. This program offers the opportunity for our Affiliate organizations to obtain an implementation fund to support the program in their communities. This project is a collaboration of scientists and educators at the Smithsonian Astrophysical Observatory (part of the Harvard-Smithsonian Center for Astrophysics in Cambridge, MA) in collaboration with Smithsonian Affiliations, with funding from the Smithsonian Institution’s Youth Access Program. 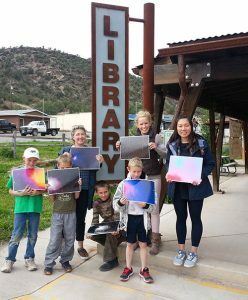 In 2012, the Smithsonian Astrophysical Observatory (SAO) and Smithsonian Affiliations began Youth Capture the Colorful Cosmos, an astrophotography project to introduce young students to the wonders of the universe. Since then, YCCC has grown to include more than a dozen Smithsonian Affiliates and is one of our most successful collaborations. The goal of YCCC is to provide nationwide access to Smithsonian resources, and to engage newcomers to astronomy. Students take images of the cosmos and make them accessible through manipulating the photograph to produce individual interpretations of the images. Along the way, participants learn important 21st-century skills and engage in Science, Technology, Engineering, Arts, and Math (STEAM) practices. This program, in its third round of programming, has generated a new partnership with the National Science Foundation. Our Smithsonian Affiliate partners have created a community of learners in online discussions and webinars to learn how to manipulate the telescopes to request images of planets, galaxies, and nebulae, all from their own computers, and share their experiences with one another. By opening a web browser, students select the telescope targets and exposure time, and the images will be taken that evening and emailed the next day. See YCC in action at The Children’s Museum of the Upstate and Cerritos Library.